What’s in a Small Business Name? This case study is instructive in a number of ways. The first question that comes to mind is why the name “Isis” (the name of the Egyptian goddess of nature, love, health, and magic) was chosen for the digital wallet offering in the first place, as it seems far less descriptive of the product offering than does its replacement. Perhaps the ISIS association was simply a good excuse to change a business-hampering name. Getting the name right the first time is not only important to a successful launch, it can make your branding and marketing life substantially easier and more effective throughout the life of your business. It’s easy to spot a bad name when you see one, but what makes a really great one? There are a number of different strategies you can use when selecting a name, but they all agree that a great name is one that truly represents the image your company wants to portray. They diverge on how exactly to get there. A recent LinkedIn post, The Minimum Viable Name – A Product Naming Strategy, suggests breaking the universe of product names into four quadrants: Features-Functional, Benefits-Functional, Features-Emotional, and Benefits-Emotional. It recommends striving for branding that emphasizes benefits over features and emotions over functions, thus making names falling into the Benefits-Emotional quadrant the most effective. The post provides examples for each category, along with a diagram showing some well-known brands and where they fall. A recent Business Insider post delves into this question of What Makes The Best Brand Names So Good, and notes that scientific research has shown the relationship our brains form between shapes and sounds can be used to create a symbiotic relationship between company names and logos. For more on what makes a great logo, and how logos work with brand names, see this Business Insider post. A post from The Name Inspector (a company offering company/product naming services), provides 10 tips for naming your company, product, or service including knowing when to let go of an idea that is not working. Another post from the same company breaks down the 10 types of company names and provides examples, pros, and cons of each name type. For example, the most popular name type is “real words” but they come with the disadvantage of wide-spread use and difficulty with securing the associated domain name—which is of critical importance in today’s Internet world. If you’re totally stuck for a name, or a domain name, there are many free online tools available that can help. On really good one is GlobalNaming.com. You can use the tool to find a new name, and to analyze your potential choices to make sure they do not have offensive meanings in other languages, to look at the meaning variations for all the word components in your chosen name, to look at possible visual layouts for the name in a logo or on screen, and to check domain name availability. Another great tool for finding available domains that also make great product and company names is Panabee. (Added Tip: Use Panabee to search for your current domain name. It will provide a large list of similar names that you might want to defensively snap-up so that another company can’t get them.) For additional resources see the Mashable post 18 Tools for Picking the Perfect Domain Name. Once you’ve found a name you like, and you have an available domain name, there is one more very important step you’ll need to take—make sure that another company is not already using that name, or a confusingly similar name, in the same industry. Your first stop should be the U.S. Patent and Trademark website (uspto.gov). Start with a simple Trademark Search for the exact name you want to use, and if that does not turn up a match, try something more general. (For example, if I were searching for “PaySimple” I would start with a search for “PaySimple” and then try both “Pay” and “Simple” separately.) If another company in your industry is already using the name, or a similar one, it will avoid future problems if you discard your choice and go back to the drawing board. If your Trademark search is clean, you should also do an online search for the name you’ve chosen and your industry (i.e. 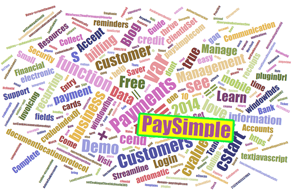 “PaySimple Payment Processing”) to see if another business is already using the same or a similar name for the same products and services. If another business is using your name but hasn’t trademarked it, you’ll need to evaluate whether your name choice still makes sense—which it might, particularly if your company and the other business operate in different regional markets. A recent Entrepreneur post, 5 Tips on Rebranding from a Billion-Dollar Expert, provides useful advice if you need to go the rebranding route. The Fortune post, The worst (and best) company name changes, provides detailed examples of the rebranding process working well and going awry. On the logo front, the 10 Best Corporate Logo Changes Of 2013, provides ten detailed examples of successful logo updates. For more successful rebranding examples, including a detailed analysis of each, see the 2014 REBRAND 100® Global Award winners list. Note that being a big company with lots of resources does not necessarily give you an advantage, as wonderfully illustrated by this old PC World post on The The 10 Worst Microsoft Product Names of All Time, and this hilarious parody video Microsoft Re-Designs the iPod Packaging.